If we then solve for , we find the proportion of bets on team A for which the two functions intersect. This gives a point of indifference, as the payoff from the portfolio will be the same no matter who wins. If this payoff is above zero, then there has been inefficient pricing between agencies and there is an opportunity for a risk-free gain. In the real world, it is highly unlikely one agency will ever give the bet placer this opportunity, as it would lose. However, if one agency disagrees with another on the likelihood of a team to win enough, the strategy may become viable. Therefore, the Demonstration allows for two agencies and mismatches their odds within the weighted portfolio. 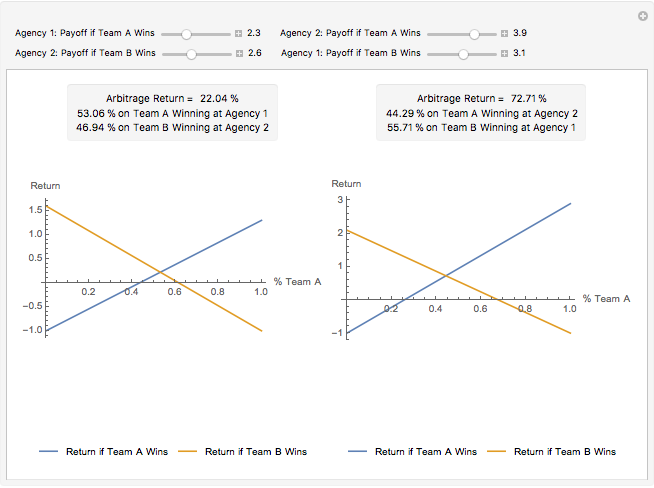 The first graph shows the outcomes if the bet placer bets on team A with agency 1 and on team B with agency 2. 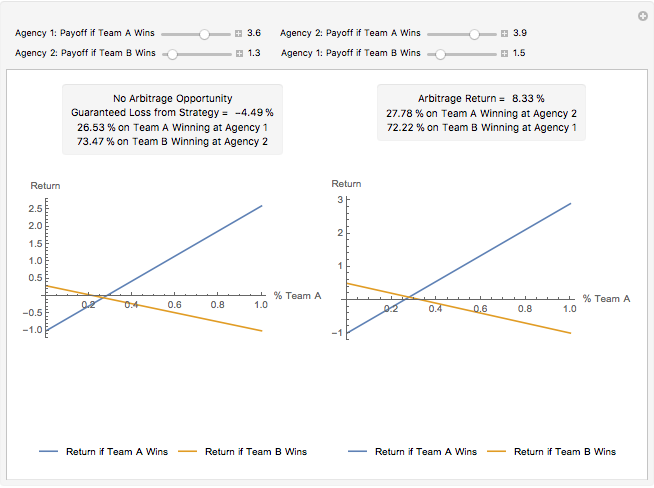 The second graph shows the outcomes if the bet placer bets on team A with agency 2 and on team B with agency 1. A recent study by Franck, Verbeek, and Nüesch (2013) shows the viability of this using a similar approach in European football matches. 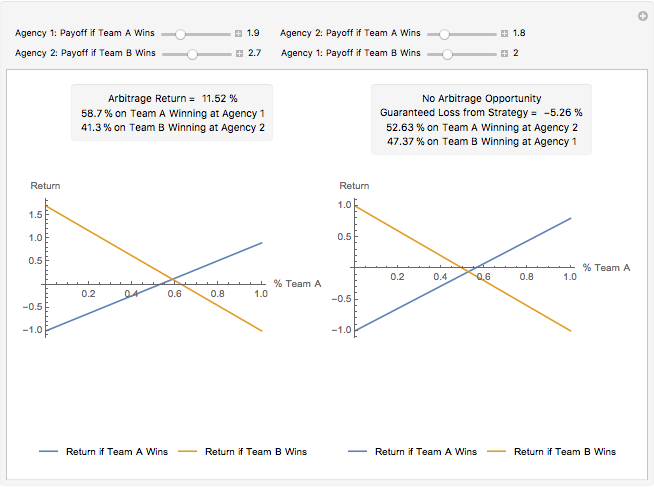 They apply a three-outcome approach (win, lose, draw) across not only multiple agencies but also betting exchanges. They document that 19.2% of the matches in the top five European football leagues exhibit arbitrage opportunities. E. Franck, E. Verbeek, and S. Nüesch, "Inter-market Arbitrage in Betting," Economica, 80(318), 2013 pp. 300–325. doi:10.1111/ecca.12009. B. R. Marshall, "How Quickly Is Temporary Market Inefficiency Removed?," The Quarterly Review of Economics and Finance, 49(3), 2009 pp. 917–930. doi:10.1016/j.qref.2009.04.006. Tom Stannard "Sports Arbitrage: Two-Agency, Two-Outcome Efficient Pricing Test"